Man, you are going to crush it this weekend! Well, sounds like I need to learn how to read a calendar. Rhett, let's postpone crushing it one week, okay? Yes November 3 is the big day. 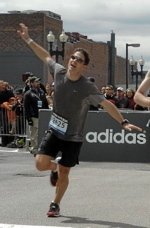 Having nursed my calf injury the last few weeks, I�m going to have to reset my expectations of what �crushing it� means. Rhett, Seems to me your ready to go and run the Mt. Lemon Marathon in 11 days...Go have a great run! Run Happy! Go do the best you can and make yourself happy and be sure to make us all proud!